Announcing that Yunasoft Inc., the developer of Awesome Calendar, has just released the latest update for iPhone, iPod touch and iPad users. Awesome Calendar 2.0 retains its original features, such as auto syncing to Google Calendar, photo embeddable note making, localized current and forecasted weather, todo list management and sharing from within the app. This update, however, includes the long awaited sync with Google Task feature, a map displaying appointment locations and several other new features that take efficiency and productivity to a new level. Since its original release, Awesome Calendar has found great favor in the App Store. So far, users have complimented the elegant interface, speed, ease of use, and comprehensive all-in-one functionality, as well as the impressive host of features offered. People have also taken note that this developer listens to their clients, and considers their suggestions for future updates. With the newly added features, this update has garnered even more enthusiastic feedback than previous versions. Awesome Calendar began with an extensive list of features, including automatic Google Calendar syncing, diary notation with embedded photos, localized weather reports, holiday notations for 35 countries, and much, much more. Users are able to add, edit and view their calendars in a multitude of ways, can create and group todo tasks, and can now cancel events when in "Edit" mode. 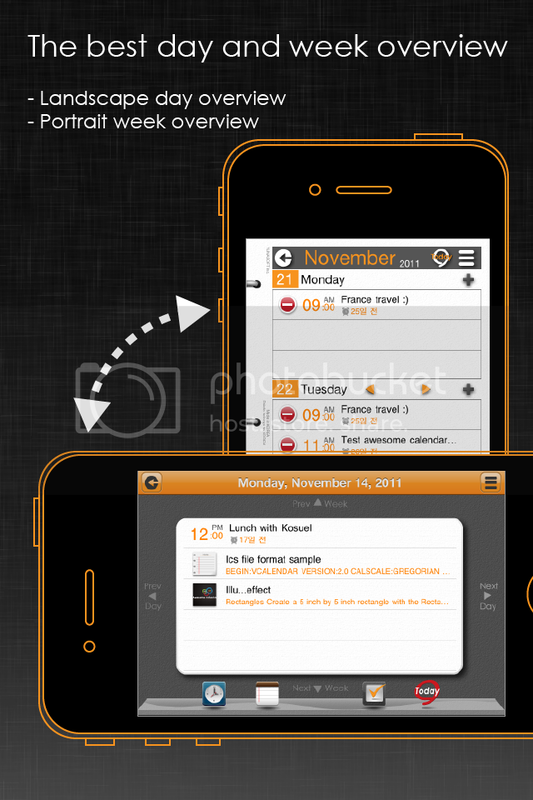 Awesome Calendar is an efficient organizational tool for mobile workers, team projects, and individuals. In addition to the original features, the features included in this update ensure that users can work more efficiently than was ever believed possible. About Yunasoft Inc. Yunasoft Inc. is dedicated to creating social mobile applications that better people's lives. A young company founded by Robert Kwon, Yunasoft has a vision of reaching and helping people across the globe with their products. To that end, the Yunasoft team keeps their minds open and stand ready to hear what people have to say. Los Angeles, California - Yunasoft Inc. is dedicated to creating social mobile applications that better people's lives. A young company founded by Robert Kwon, Yunasoft has a vision of reaching and helping people across the globe with their products. To that end, the Yunasoft team keeps their minds open and stand ready to hear what people have to say. Copyright (C) 2012 Mobile-App-Marketing-Makeover. All Rights Reserved. Apple, the Apple logo, iPhone and iPod are registered trademarks of Apple Inc. in the U.S. and/or other countries.